Ok, I'm back. I had to go and look to see where I had last left off. Now I'm back on track. Our last 6 days in Canada were spent in a tumultuous vortex of Rubbermaid Action Packers and mounds of things to be packed in them. As we are shipping our things to Uganda by air freight, we decided (upon the advice of those who have gone before us) that we would use "Action Packers" as our shipping containers. These are very sturdy containers and yet they are small enough to be able to move around with relative ease. When the last item was packed and the dust settled we had 13 action packers stacked up in my parents garage waiting to be sent over to join us in Uganda. This mound of "stuff" was on top of our 15 "normally sized" suitcases, our 5 roller type carry on items, and our 5 back packs which would be traveling with us on the plane. Our last Sunday in Canada saw us attending church at Grace Bible Fellowship church in Sexsmith. GBF has been our home church whenever we have lived in the Sexsmith/Grande Prairie/Rycroft areas. There weren't rivers of tears shed, but at the same time there were tissues passed up and down our row as we and our family sniffed our way through the service. After the service was over, Karen and I hung around for as long as we could so that we could say our goodbyes to many of our friends who attend that church. After church we had lunch with my immediate family, and all of my brothers and sisters were able to be there. Even though we didn't spend a lot of time with them that day, it was still really good to have that last time with them. This brings me to Monday. If I'm being honest, Sunday night was not a very restful night for me. My mind wouldn't let me get into a really deep sleep, instead allowing me to cat nap my way through the night. The morning quickly sped by as we made final arrangements with clothes in the carry-ons, and making sure that we were ready for the next few days of traveling. Leaving my parents house that day felt a little to me like the end of one chapter of our lives. If I had to give it a title, I might call it "Preparation & Anticipation" or something like that. The time of preparation was now behind us and now it was time to put into use all of the things that we had been preparing for during the previous 12 years. Because of the amount of luggage that we were taking with us, we arrived at the Grande Prairie airport several hours early to give ample time to check in for our flight. Check in went without a hitch, as the bag which we were the most concerned about weighed in at 50.1 lbs. They all went through the security check without a problem and almost before we knew it, we were lining up to say final goodbyes. Karen's family had also come out to see us off at the airport, and it was no surprise to anyone that again tears were flowing freely as we said our farewells. Our kids also broke down a little bit for the first time in this whole process when they said goodbye to their cousins. As I heard mentioned several times that day, "A year is a long time, and we won't see them for at least 2!" As we rounded the corner through security and left our families behind, there was definitely a sense of sadness at leaving behind our loved ones, but also a lot of thrill and anticipation at the adventure that lay ahead of us. To be honest, having our families out of sight helped the kids a lot to focus their attention from what was behind to what was ahead. We boarded our flight, waved at the building in case any of them were still there watching, and our kids experienced their very first airline flight. Thankfully, they loved it. We flew from Grande Prairie to Edmonton, and during our short time on the ground in Edmonton the crew discovered what we were heading out to go and do with MAF and I was able to have a good chat with the captain and first officer. We then left to Calgary, where we met my uncle and aunt as well as my cousin and his family. They helped us collect all of our bags, and we then took them up to check them in for our British Airways flights. There was a small glitch that we had to work through at the B.A. check in counter, but after a short prayer huddle things were sorted out and we gave a few more final hugs and goodbyes. We departed Calgary just before 10:00pm and headed eastward on a full-to-capacity Boeing 767. After a night of not much sleep, we arrived at London/Heathrow where we had an 8 hour layover. MAF had booked a room for us in terminal 4, so we made our way there and all enjoyed a few hours of delicious sleep while we waited for our flight to Entebbe. We made our way back to terminal 5 and through security and almost before we knew it we were again taking wing, this time southbound as we sped through the night towards Uganda. As we watched the little airplane on our monitors cross the border from South Sudan into Uganda, sunlight began to peak out over the horizon. What it illuminated wasn't what I had been hoping to see. All we could see in all directions was cloud. Oh well. The sun continued to rise, and as it did the low lying cloud began to burn off and give us our first looks at Africa. To be honest, it did look a lot like many of the pictures that we had seen, but to see it first hand and to know that this is now home made it very different than looking at a picture. It was also flashing through my head that it won't be too long before I myself will again be flying over that same terrain, this time behind the controls of a Cessna 206 aircraft instead of riding along on a jumbo as a passenger. To Karen and I, it was an answer to prayer to see our kids excitement surge as we left the airplane and placed our feet on Ugandan soil (tarmac is still soil, right?). Two of my colleagues from MAF Uganda were there waiting for us airside as we got off the plane, and they guided us quickly and without hassle through customs and immigration. In my tired state, I was very thankful to have them there with us. 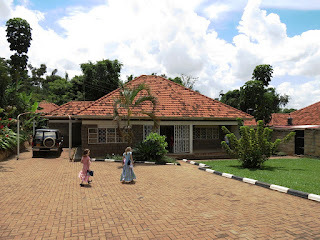 They drove us out of Entebbe and into Kampala, and before we knew it we were pulling up at the gates to our home. I can't even describe what a relief it was to walk into our home and see couches, a table with chairs, and to go to our bedroom and see a bed waiting for us! One week later, the jet-lag is behind us and we are starting to feel the rhythm of life here. I could go on longer about some of the things that we have experienced already, but I think that it should wait for another time. 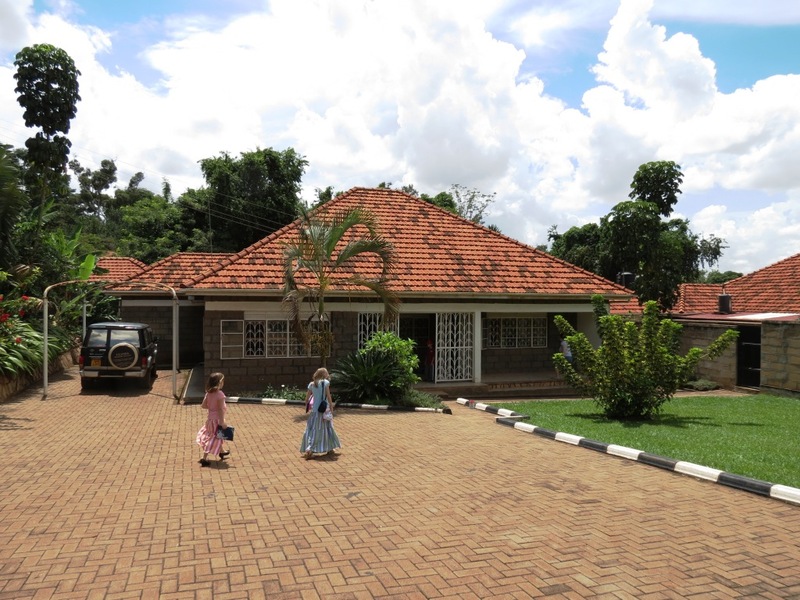 Once again, we thank you who have been praying for us as we have made the transition from Canada to Uganda. It is no lie to say that we have felt the impact of those prayers. May God be praised for His work in all of our lives. so great to see initial pictures and hear of your safe (and long!) travels. We are so looking forward to hearing all about your life in Uganda.....blog lots okay? :) Give the kids a squeeze from K & L....and give Karen a hug from me. Blessings you guys.